The tall, powerful Yamnaya people, who occupied the Eurasian steppe north of the Black Sea and the Caucasus mountains in what is now Ukraine and Russia, arrived in Europe between 5000 and 4000 years ago, colonising huge areas of the continent. In doing so, they wiped out huge numbers of the people already living there - and interbred with the women, with the result that their genetic lineage is still traceable in our DNA today. Professor Kristian Kristiansen of the University of Gothenburg in Sweden, an expert in the ancient people, believes he is beginning to build up a picture of how the situation came to pass. He said: “The Yamnaya were the earliest pastoral people in history, and they lived on a protein rich diet based mainly on meat and milk products, plus some fish. They did not practice agriculture. “Consequently they were rather healthy and tall as well, due to their highly mobile life. In fact there is a height gene linked to them. “They were fair and mainly brown eyed as far as we can see. 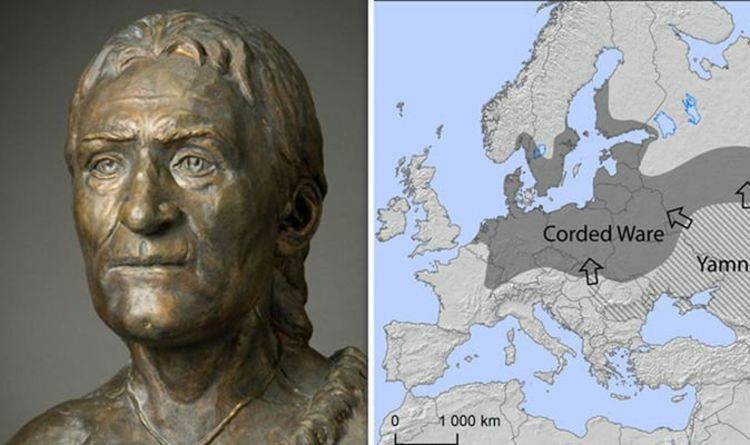 Prof Kristiansen said the Yamnaya, who became known as Corded Ware after arriving in Europe in about 2,800 BC, were known to have interacted with the indigenous Neolithic groups. He added: “We also know that Yamnaya migrants were 80 percent males – young warrior groups – who therefore needed Neolithic women for their reproduction. Therefore, there had been interaction between the Yamnaya and the Neolithic natives for a few hundred years, Prof Kristiansen said - in his opinion, frequently characterised by violence. He explained: “We have the famous Eulau cemetery of a few Corded Ware families that had been murdered by outsiders from a nearby Neolithic group. “The same Neolithic group from where the women apparently had been abducted years earlier. “And now came the revenge. They were buried family wise, man and woman and evtual children, their offspring, so Corded Ware seem to have practiced monogamy as the social norm. “However, we also know that Neolithic male lines simply died out, only the Yamnaya/Corded Ware male lines persisted, even to this day. “How was that possible: based on a recent global study of captives in pre-state societies by Cathy Cameron she demonstrates that in all known societies raiding for women for labour and reproduction was common, and also common was to kill the males, to prevent revenge, or at least reduce their capacity for immediate revenge. “We find more and more archaeological examples of massacres, sometimes only of young males from the 3rd millennium and onwards. “Taken together it suggests a prevailingly violent relationship between remaining Neolithic groups and the new migrants, which does not preclude the Neolithic women could have themselves looked up these more successful groups from time to time for marriage.